When I served this last week, a teenager at my house said "this is my favorite experience eating chicken." That's a pretty ringing endorsement. 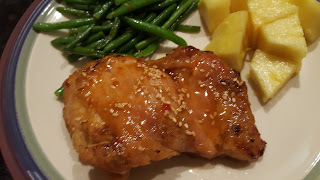 And it was deserved - this is a great way to cook chicken - swimming in sauce in the instant pot, then finished off under the broiler to brown and crisp it up. I can imagine all kinds of other sauce options that would work well with this same method. Chicken thighs cook beautifully in the Instant Pot, and the few minutes under the broiler really makes all the difference, texture-wise. If you want to make this more mild, leave out the crushed red pepper flakes. But even with them in, this was about the right amount of spice for my family - some of whom think ketchup is spicy. Ha! There are many more great ideas at Inspiration Monday, Mix it Up, Busy Monday, Inspire Me, Inspire Me2, Create Link Inspire, Fabulous, Hearth and Soul, Wow Me, Wow Us, Whisk It, Foodie Friday, Weekend Potluck, Awesome Friday. Lightly rub each piece of chicken with the Cajun seasoning. In a measuring cup, combine 1/2 cup sweet chili sauce, brown sugar, vinegar, garlic and red pepper flakes. Add the oil to the Instant Pot and set it for Saute. When it's hot, add the chicken a few pieces at a time and cook for 1-2 minutes on each side to lightly sear. Remove chicken to a plate. Add the chicken broth and deglaze the pot so the excess brown Cajun seasoning blends in with the broth. Stir in the sweet chili mixture. Stir and bring to a boil. Cancel the saute setting. Add the chicken back to the pot. Secure the lid and set the pressure cooker for 10 minutes. Preheat the broiler on your oven, and then quick release the pressure when it is completed. Transfer the chicken onto a baking sheet lined with foil. Combine the remaining 1/4 cup sweet chili sauce and the honey. Generously glaze each piece with the sauce. Sprinkle sesame seeds over each piece of chicken. Broil the chicken for about 3-5 minutes, until lightly browned. Remove from the oven and baste with any additional sauce. Serves 4-6. 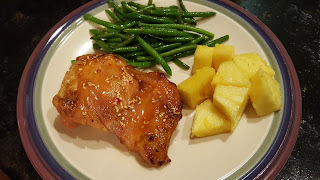 I would surely like this sweet chili chicken cause I like mix of different flavors. Must be delicious. This chicken looks delicious and I love that it's done in the Instant Pot! Thanks for sharing with Awesome Life Friday!